World Health Organization Regional Director for Africa, Dr Matshidiso Moeti, and H.E. 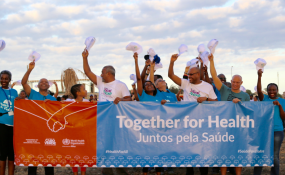 Dr Fernando Elísio Freire, Minister of State, Parliamentary Affairs, President of the Council of Ministers and Minister of Sports joined hundreds of people who held hands and stood side by side in an umbrella shape on Quebra Canela beach in Praia to show their solidarity for universal health coverage. Nairobi — The Government of Thailand has committed to continue working with Kenya's Health Ministry to leverage on achieving the Universal Health Coverage which is one of the key pillars in the country's Big Four Agenda. Thailand has successfully implemented the UHC programme for its citizens and their package includes in-patient, out-patient and emergency care to all nationals. Due to this major milestone, Health Cabinet Secretary Sicily Kariuki and her Thailand counterpart Emeritus Piyasakol met last year in May in the sidelines of World Health Assembly in Geneva, Switzerland and entered into a deal with Thailand so as to assist in formulating the best service delivery package for the country's Universal Health Coverage (UHC) plan. Thailand is now one of Kenya's advisory and technical partners in UHC implementation. Speaking during his visit in the country on Thursday, Piyasakol said they will work hand in hand with the Ministry of Health in Kenya to achieve the full implementation of UHC. "I wish to reaffirm my commitment in developing our health deliberations," he said. As part of the collaboration, already over 50 participants from Kenya have been successfully trained on Health Technology Assessment by the Health Intervention and Technology Assessment Program (HITAP) in Thailand. Also accompanying the minister in the delegation was the Deputy Permanent Secretary of the Thai Ministry of Health Supakit Sirilak who said that UHC doesn't only mean 'financial protection' but more on universal access to comprehensive health services. He said that they started their journey to achieving UHC by developing a health system that ensures universal access to essential health services. Further, he explained how they focused on funding rural facilities to improve health from the community to district level which reduced crowding in city health facilities. Motivation of health workers and equipping all levels of hospitals with essential medical equipment is also said to be a plan they applied. The South East Asian country is just about the same land mass and population as Kenya and they have achieved this important milestone in health, despite having a low gross national income per capita at the time they started their journey back in 2002. CS Kariuki reported that the country is on the right track towards achieving UHC, adding that they have so far recorded success in UHC piloting which is currently taking place in four Counties. Apart from Thailand Kariuki has also met with Cuban health minister, Zimbabwe, South Africa, Burundi, Guinea Bissau and United Kingdom. Already 100 medical specialists from Cuba have been imported in the country and posted to various counties.